The western gull (Larus argentatus) is the most common gull seen near the Caves. The adult has a wing span of 24 to 27 inches, and is buff and olive colored, mottled with white or shades of brown. 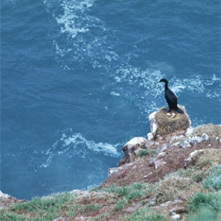 It generally nests on the rocky ledges above the cormorants and lays two to three eggs. The herring gull (Larus argentatus) is approximately the same size as the western gull but it has a somewhat lighter mantle. It lays as many as four eggs and sometimes nests in trees instead of the rocky cliffs. The California gull (Larus Californicus) is seen only on rare occasions near the Caves. It is considerably smaller than the western and herring gull, its color is more brown and it prefers inland water, particularly for nesting. All three types of gulls feed on refuse and fish and become quite tame in the presence of humans. But it is interesting to note that if a predator such as an eagle or hawk enters the nesting area, the gulls will immediately attack in forces of 100 or more, chasing the intruder away or even forcing it into the water to drown. Cormorants (Phalacroxorax Penicillatus) are found throughout the world. Brandt's cormorant is the most common cormorant seen in the Sea Lion Caves area, ranges from Baja California to Southern British Columbia. The Brandt's cormorant begins nesting in the spring, laying a clutch of three to six eggs. The young are dark brown at birth, but as they mature they turn almost black. Occasionally the pelagic and double crested cormorants are seen nesting with the Brandt's on the rocky ledges outside the cave. Cormorants are excellent swimmers because of their web feet. In some parts of the world a ring is placed snugly around the bird's neck so that it cannot swallow its catch, and it actually taught to bring fish back to its trainer for a reward. The pigeon guillemot (Ceppus Columba), a migratory bird, usually appears at Sea Lion Caves in early April when its mating season begins. It is similar in species to the murre of the East Coast, and is called dovekie by sailors, who often encounter it far out to sea. The pigeon guillemot is black with white patches and markings on its wings. It has bright orangish-red feet which trail in flight, looking like a scarlet tail. Its voice, a shrill, hissing whistle, sounds much like a canary. The murre family of seabirds is fairly numerous throughout the Northern Hemisphere, but the particular variety found at Sea Lion Caves is rather rare. 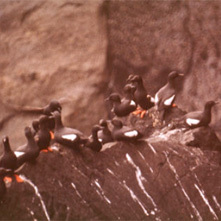 The pigeon guillemot builds its nest of seaweed or grass on the ledges inside the caves, and lays a clutch of one to two eggs. The parents feed small fish to their young until they mature and are able to care for themselves. This unique bird seems to spend its winters miles from land, living right on the ocean, and comes to shore only to nest. In fact, early sailors often believed that the pigeon guillemot bore its young alive because the sailors only encountered the birds far out to sea where no nest could possibly by built. Frequently seen surface (ground-dwelling) birds include grouse and quail. Occasional birds of prey include peregrine falcon, hawks, ospreys, vultures, owls, and the bald eagle. Other shorebirds and waterfowl include herons, geese, common murre, tufted puffin, marbled murrelet, black oystercatcher anklets, sandpiper, dunlin whimbrel, snowy plover, killdeer, cave swallows, and ducks. Sea Lion Caves is almost as well known as a bird rookery as it is for the sea lions. The elevation of the giftshop and offices above the Sea Lion Caves permits a seaward view of approximately 20 miles. Because of his vantage, Sea Lion Caves has become a favored post from which to watch birds, sea lions and whales.